This video was shot by Delane Cleveland at The Secret Garden Fashion Show on April 16, 2011. 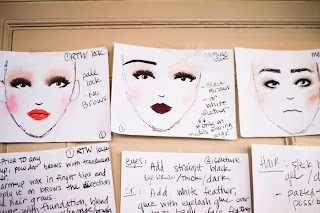 I helped design the different makeup look with the Secrets Fashion Agency team. Even though I wasn't able to help out with the hair and makeup on the show due to another event I was part of (Nordstrom's Beauty on Location Event, with Trish McEvoy cosmetic). I came up with the ready to wear women's and men's makeup look, ready to wear hair look, and haute couture makeup look. The hair design for the haute couture segment was styled and created by Tease Salon, located in St. Paul. If you missed the fashion show, watch the video in the link below! SFA: A Glimpse Into The Secret Garden: "Thanks to Delane Cleveland who did an amazing job capturing the ideas and inspiration behind our fashion designers, and the creative visi..."
These are the looks hand drawn by me. Photo by Chris Mcduffie. Working, coming up with the looks before the show. I also styled hair and did makeup for a pre-lookbook shoot on model Twee Nguyen styled by Secrets Fashion Agency and shot by photographer Sam Nong. Below are photos of The Secret Garden Fashion Show's designer's looks.